Can it be? Four weeks back into the season already?? I can hardly remember that I was on layoff a month ago. We finished learning Emeralds on Friday. Elyse Borne has been here for the past week and a half staging the ballet (how fantastic to have her here again! Elyse staged Nutcracker for us back in 2003). Emeralds is a 30-minute long immersion in lush, velvety, sumptuous music and dancing, all contained in the warmth of a jewelbox setting. To the audience it should feel like entering another world, completely removed and very, very far away from the chaos and pace of life outside the theater. Elyse has been urging us to explore and find ways to create that effect without becoming monotoned or in other words... boring. 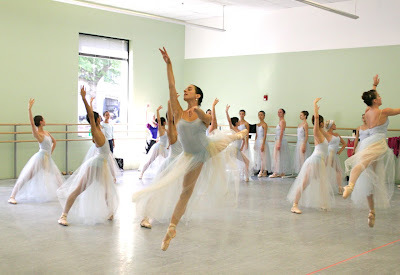 From what I've seen from my fellow dancers in rehearsals, the ballet will be mesmerizing. 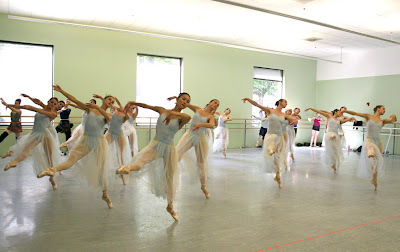 The choreography relies heavily on certain steps that create that effect, when done well. Unfortunately, bouree-ing around as much as is required in Emeralds is a painful process, especially when we're aiming for an ethereal look. My feet were as grateful for the weekend and two days out of pointe shoes as they have ever been! Atleast not for part of the day. 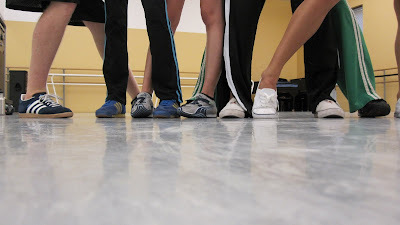 Rehearsals have begun for Trey McIntyre's Speak (1998), where us dancers get to ditch our ballet slippers/pointe shoes for sneakers and take a break from classical music to groove to the Bloodhound Gang. I am very excited to be a part of this work and very excited about the diversity audiences (and dancers) will enjoy in our Emerald Retrospective come October. "Summer vacation" (if you can call it that!) has already faded into the distance as we plunge into the heady work of putting together the program for our first performances next month. Since this is a retrospective program, there are several excerpts from different ballets that need to be taught, learned, and rehearsed. I have a feeling that arranging casting for these shows is going to be very similar to trying to line up a Rubik's Cube. With several short pieces back-to-back, only a pause in between, figuring out who can dance what ballets with enough time to change costumes is going to be tricky, but I'm sure Lisa and Christopher will work it out... and all we dancers have to do is learn a lot of choreography and dance it! About five of the excerpts have already been worked on over the past two weeks, which is a lot considering we also got Serenade together last week for the Oregon Symphony concert. Carol Shults, OBT's former dance historian and the current trustee of the works of Dennis Spaight, has been in this week to stage the two Spaight pieces we're doing. That's been a treat, and certainly not only because she's been bringing in bags of apples from her garden each day. Now that we're all back together at work again, I'm struck by how quickly we fall back into our usual rhythm and routine. It's as if three months apart never happened. Last June was only a week ago and our crew has just keep on doing what we do best-- feeding off of each other's energy, being inspired by the potential in the studio, and bringing dance to life. The next four weeks will be very full and will fly by. This is going to be a tremendously exciting program for all of us, and for our audiences, I can tell already! Summer Vacation? Not at OBT! 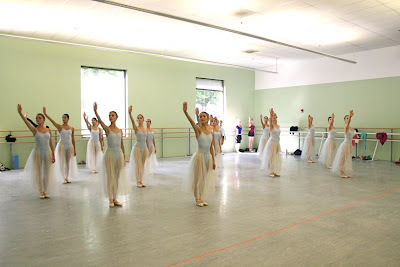 This summer seemed to be especially busy for all of our dancers. Artur and his wife had their first child, a very dedicated and generous group of dancers performed for FREE in locations all around Portland - from Washington Park with the Portland Cello Project, to a live art installation on Alberta for Last Thursday - and a few others spent time abroad with guest appearances and gigs with other companies. 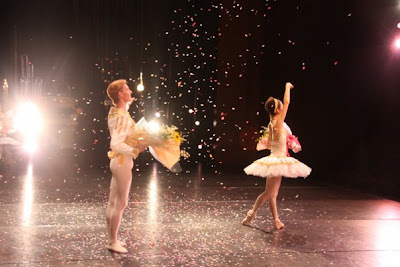 After which Chauncey headed off with his wife Makino (who is also a dancer) to Fukuoka to perform. 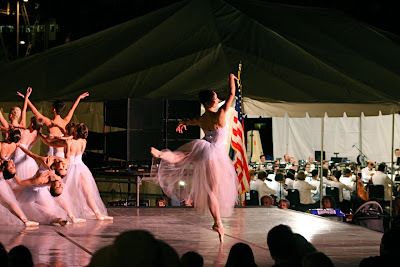 Ronnie Underwood has spent the summer in Oklahoma and was recently spotted onstage with Oklahoma City Ballet in their annual outdoor event, similar to OBT's "Exposed." He's back in the OBT studios next week to begin rehearsing for our opening program: Emerald Retrospective. See you all in the theater in October! 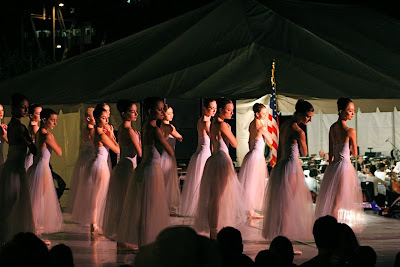 Here are some more "backstage" photos from our Waterfront Park/OR Symphony performance the other night. It truly was a magical experience. From the beautiful setting to the sublime music to the perfect weather and full moon, it really seems like the stars aligned. Getting all of us 18 women (or however many we were!) transported to and from the park twice in one day for rehearsal and the show, figuring out how and where we could warm up, dress, rehearse, stay warm, etc... was a team effort and required some flexibility on everyone's part. Here's Kathi showing off her moves in our makeshift warmup area. I'll never be able to walk along the pathway by the river again without thinking about the time I did barre practically underneath the Hawthorne Bridge. Here's the travelling wardrobe department. That black curtain was our dressing area, which we shared with Carlos Kalmar (not at the same time, of course). And this was the view during our morning rehearsal. After we'd finished the runthrough, everyone spent a few minutes just soaking up the glorious sun and enjoying the moment. If you were one of the thousands who joined us on the waterfront last night for the Oregon Symphony's annual outdoor concert, you know just how perfect an evening it was. The weather was incredible, complete with a deep blue skyline and a bright, full moon. Our Symphony is one of the best in the nation, and as the concert ended with the booming cannons of Tchaikovsky's 1812 Overture and a fireworks display to rival the 4th of July, I can't imagine there was a doubt in anyone's mind about that. 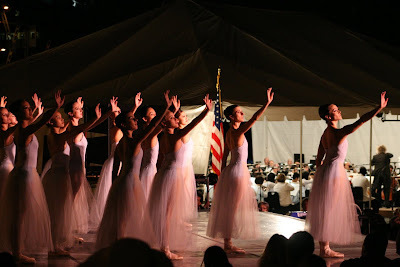 But, for me (and likely all of us at Oregon Ballet Theatre) the highlight of the night was watching our 16 ballerinas in ethereal tutus share the stage with our phenomenal Symphony. Free Performance with the Oregon Symphony Tonight! 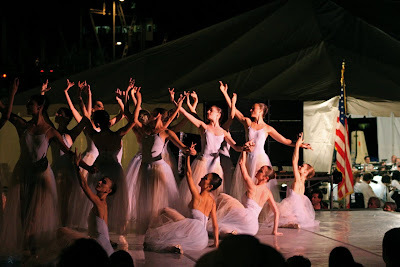 Oregon Ballet Theatre joins the Oregon Symphony for a free outdoor concert on the waterfront tonight at 7pm. We'll be performing an excerpt from George Balanchine's Serenade, and from the looks of yesterday's rehearsal it's going to be breathtaking. 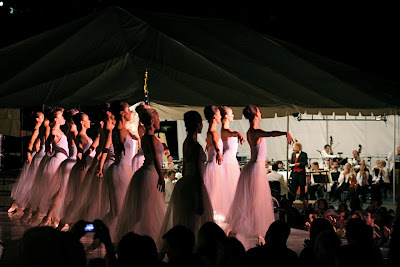 OBT dancers + live orchestration + the natural beauty of Portland's waterfront = SOMETHING YOU DON'T WANT TO MISS! 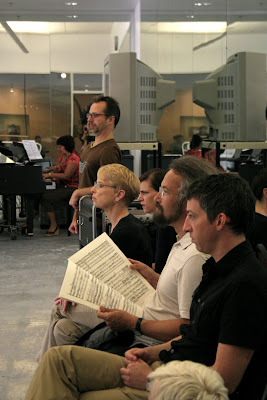 Yesterday afternoon Symphony director Carlos Kalmar stopped in to watch a dress rehearsal. 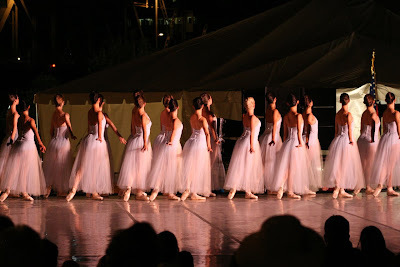 The dancers ran the piece in costume - which with the airy, delicate Serenade tutus is probably one of the prettiest things you'll see in a lifetime. 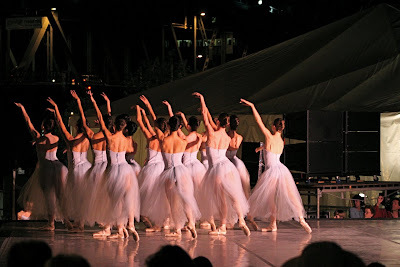 Carlos sits with Tchaikovsky's score, noting nuances in the dancing that help determine where the music's tempo should be sped up or slowed down, or on which notes his musicians should linger a bit longer. After the dancers have finished their first run-through of the piece, Christopher and Carlos talk about small adjustments in the music's timing as the dancers take mental notes about the changes for the next run through. Fall.Art.Live last weekend was marvelous. It was a huge success in every way that I could tell, from the public turnout and satisfaction to the seamlessness of the events to the beautiful weather. (Perhaps the only unforeseen problem was the fact that leaves and twigs kept falling on the stage all afternoon, but that sort of added to the "au naturel" effect of the whole thing anyway). 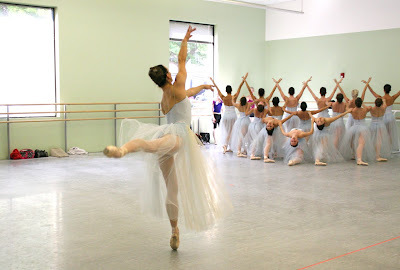 In other news, now that we dancers have returned to rehearsals it seems that the OBT 2009-10 season is officially under way! The first item on the agenda is preparing an excerpt from Serenade which we'll be performing on Thursday night at the Oregon Symphony's annual Waterfront Park concert. 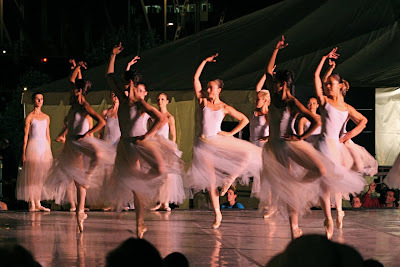 Serenade is an unbelievably gorgeous ballet, lush, regal, elegant and so very moving. Performing it outdoors with the Symphony playing Tchaikovsky's heart-wrenching music is going to be an unforgettable experience. The only thing that makes me sad is that we are only doing a short snippet of the ballet. 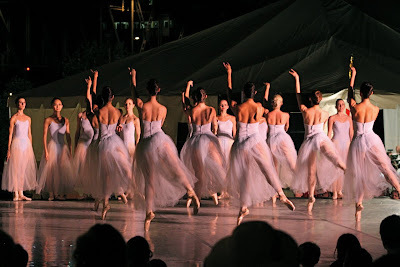 There are many reasons why we can't do the whole thing, but having just a taste of Serenade makes me crave that wave of emotion and movement that the full arc of the ballet creates. Alas... maybe someday. Meanwhile, we're also starting to put back together the scherzo from A Midsummer Night's Dream for the retrospective program in October, and soon the rehearsal schedule will be full of new ballets to learn and old ones to remember. It's going to be an exciting several weeks as we retrace OBT's history and prepare to celebrate it with our audiences.